There are thousands of job boards, but Babajob.com will surprise you. We are used to Naukri.com and Monster.com who promote the well-qualified and the upwardly mobile. But here is a website which will help you hire those who virtually run our everyday lives. 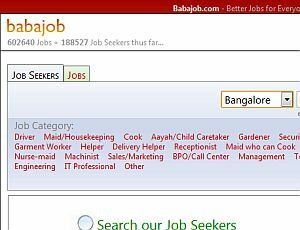 From drivers to cooks and domestic helps - blue-collar workers are registering with Babajob.com to seek suitable openings. Only last week, Babajob.com crossed six lakh job listings and now features around 38,399 employers (both companies and individuals) online. Traffic to the website and the mobile site is growing at 400 per cent year-on-year and together they register 250,000 page views, of which 60,000 are unique visitors. The journey has not been easy, though. It has taken the Bangalore-based start-up two whole years to reach one lakh job seekers. However, this number has doubled in the past six months and with the momentum building up, Babajob Services Pvt Ltd plans to enhance its presence across the country, launch a premium service and invest in business development. 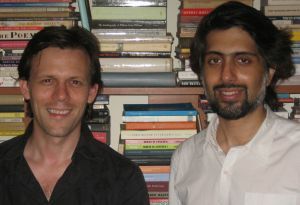 Babajob was set up in 2007 by Sean Blagsvedt, an American national who moved to India in 2004 to work on language technologies and solutions at Microsoft Research's Bengaluru centre. Absorbed by India's poverty, he left a cushy job after three years to set up Babajob.com and Babalife.com, websites that would aim to change today's society for the benefit of the underprivileged. While Babajob was a recruitment portal, Babalife.com was a social network where members could effectively interact with the bottom-of-the-pyramid factions of society. Says Blagsvedt, "When I began my research on Indian poverty and what caused people to lose their income, I learnt that they managed to get out of the situation through income diversification. So, the first task of Babajob.com was to map out the way people find jobs which, we thought, was mostly through their friends and families. Understandably, their opportunities would be limited because they depended on that kind of network. But as we researched further, we learnt that people were finding jobs because they fulfilled three or four other criteria such as location and language, rather than loose social connections." Blagsvedt and his step-father seed-funded the start-up and soon raised a small amount from angel investors. The combined funding was less than Rs 2 crore. Blagsvedt then roped in Vir Kashyap (who is now the COO) and another colleague from MS Research as CTO, along with three employees, to launch Babajob Services Pvt Ltd. In the initial stage, the team made door-to-door visits, filled out registration forms for job seekers/employers and then uploaded the data. They interacted with 3,000 individuals for a period of six-nine months before launching the website. Most of the early employers listed on the site were expats and Indians who had recently migrated from California, USA. Soon there was a rise in the number of people who were searching online and the company started getting online traffic as Internet users looked for domestic help in Bangalore. As it scaled up, Babajob shifted its focus from residential space to SMEs and larger enterprises as a target market. "The idea was â€“ chains like CCD hire thousands of employees for their cafÃ©s. So, where would they go to find maids and security guards?" recollects Vir Kashyap, COO of Babajob Services Pvt Ltd. Within a year, Babajob had reached 5,000 employers in Bangalore and it was then time to expand to other cities. In 2009, the team began to gather data from employers regarding their requirements and covered various cities across India. Today, the most popular job listings are for the BPO sector in Gujarat and Bihar. In 2009, Babajob made a decision to launch its service in mobile space and this business module now contributes to 85 per cent of the company's revenues. It has partnered with eight operators such as Airtel, Reliance Communications and Idea Cellular, to launch the Babajob VAS, a daily SMS service for which the company charges Re 1 a day. "When we started, we didn't know the VAS business. But we learnt about the scale, support and metrics from telcos," says Blagsvedt. Now, the mobile service is witnessing 30 per cent monthly growth, the company reports. In the past six months, it has seen renewed interest from telcos who are keen to offer genuine, sticky services to rural users. However, mobile payments may prove to be a major pain point for Babajob and the company can expect low adoption due to regulatory issues in the country. Besides mobile network operators, Babajob has also partnered with Nokia to power a section of Nokia Listings, an app which features local services, jobs and a classifieds marketplace. Next, Babajob is planning to launch apps of its own. The apps will be available in five Indic languages and uses tighter integration with phones, to allow users to take photos and refer friends directly from their address book. It has also entered into a retail partnership with Eko, a financial inclusion service, enabling Eko's customers to avail of Babajob's service. One of the key challenges faced by the company was feeding the data into the system. It was closely followed by picking the right interfaces for job seekers, especially those who don't have access to computers or the Internet. For many, Babajob appears to be a technology company targeting a non-tech savvy user base. But Kashyap says that awareness and technology adoption are non-issues. "Job seekers typically do not need to know too much about how Babajob works. If it's a place where they can find a job, they show up," he explains. While employers mostly access the portal, Babajob communicates with job seekers via text messaging (SMS), which reduces the burden of technology for those who are not tech-savvy. It also features a buddy system, through which users can help others upload resumes. Babajob has also launched interactive voice services for mobiles where voice commands work well. What works for Babajob is the combination of the online model, mobile services and offline interactions. "In India, you need the offline component to reach the bigger market," says Jessie Paul, CEO of Paul Writer Strategic Services, a marketing advisory firm. "It will work in India if you can connect the Net to the phone and also have an offline model. Others who have done this successfully are matrimonial sites like Shaadi.com." Incidentally, Paul has hired a driver through Babajob.com and notes that the registration process and locating the right hire are hassle-free. Nature of business: In the industry, Babajob is being labelled as a 'social cause' rather than as a website or a service, and this may hinder the company as it attempts to scale up its business. "It's not clear whether it is an NGO or a company, a staffing company like us or a job portal," says Manish Sabharwal, chairman of TeamLease, which has placed five lakh people in the last five years. TeamLease employs 75,000 across 700 cities and has recently received a licence to set up a vocational university for regional community colleges in Gujarat. TeamLease's model differs from Babajob's as the former hires people and leases them while Babajob matches the requirements of employers and job-seekers. Offline model: Babajob faces tough competition from staffing agencies as people traditionally choose agencies rather than a website, leaving the latter as the last resort. Then there is the unorganised sector, security guards and maintenance engineers of mohallahs and housing societies who connect residents with odd-job men and domestic help. Pricing: Salaries asked by job seekers on Babajob.com may also be higher as they have English-speaking skills and previous work experience with expats. Breadth: Babajob does not have a pan-India presence yet, which means it can only take on competition in small geographies. India still not ready: Experts warn that India is still not ready for branded services which are aimed at helping semi-skilled workers find jobs. "It's a difficult market at the bottom of the pyramid and scaling the business up to service it on a commercial basis is going to be a challenge," said Sabharwal. A site that offers similar services is LabourNet.in, an initiative by a Bangalore-based NGO called MAYA (Movement for Alternatives and Youth Awareness). LabourNet.in allows users to book a service and covers multiple segments such as construction work, housekeeping, domestic services and office-keeping. It also verifies a worker's credentials. Internationally, there are few sites which are loosely termed as 'LinkedIn for the poor.' These include Mexico's Employolisto.com, a non-profit initiative in the Philippines called Souptel and Cell Bazaar in Bangladesh. A premium service, currently in beta stage, will soon be launched by Babajob. As a result, employers will get immediate access to Babajob's database of phone numbers and the start-up will also set aside manpower as per requirements. The service is targeted at employers who are in a hurry or need to hire a large number of people. The premium feature will have fixed pricing slabs up to Rs 5,000 per month, beyond which customised services and price points will be negotiated. Blagsvedt is now developing mobile services, growing his team, and also investing in business development. "The revenue focus has been on getting the reach. Now, we are ready to expand to the rest of the country," he says. The technology platform needs refining and a website redesign is also scheduled, which will feature an easy-to-use interface and considerable time-saving in terms of hiring. Babajob currently employs 17 people, but the headcount will grow to 30 by December this year. As nearly 92 per cent of the country's workforce belongs to the unskilled or semi-skilled category, such services are definitely required as these can leverage latest technologies for the benefit of the masses. And that is how Babajob intends to redefine the traditional image of an NGO and create a replicable model for the recruitment of blue-collar workers.